For Fit Bottomed Dudes’ Week Ryan is sharing his thoughts on a new and more natural way to shave! Let’s talk about shaving for a second. Image association recalls foaming white fluff. The straight razor. The safety razor. The double safety razor. The triple safety razor. Have we gone quad yet? I vaguely remember a quad safety razor … then again, that might have been an SNL skit. It also brings to mind dinosaur embryo transfer spy kits. In fact, modern shaving aisles are filled with these lovely pressurized canisters. Press the lever and you get a handful of whipped cream to put on your face to ensure a close and smooth shave. Let’s stop there a moment. What’s the deal with the giant foam lather anyway? (Thanks, Seinfeld). But seriously, think about it. What is the point of the foam Santa Claus beard? Only the lowest layer of the foam touches the skin; the rest is just window dressing for a terrible Michael Jackson and Paul McCartney mash-up. Not to mention, have you ever looked at the list of ingredients common to the reptile embryo transfer products? What plant produces stearic acid anyway? And why the hell are we using propane or butane on our faces? What would it look like if a shaving product was actually designed for shaving? What if it was made from natural ingredients? You would have to be a super genius to avoid using a charcoal starter right? 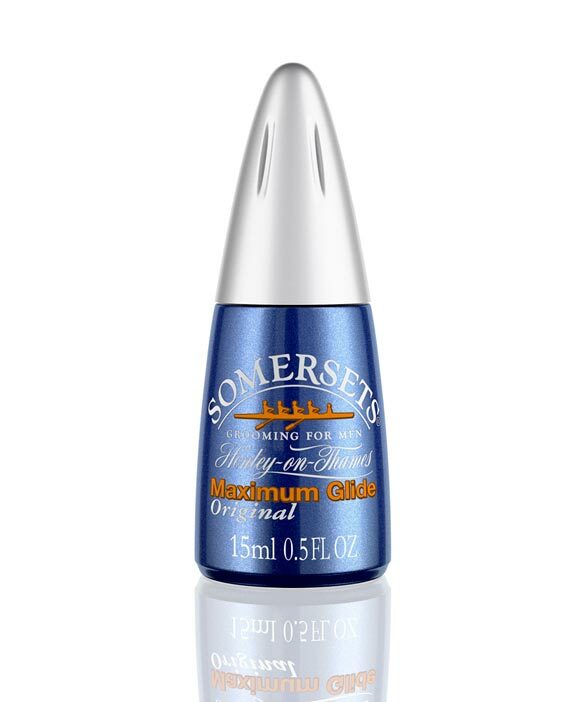 For Fit Bottomed Dude’s Week this year, FBG gave me just such a wonder to review: Somersets Maximum Glide Shaving Oil. Made of 100 percent natural plant oil, it takes three drops to prep the stubble for the blade. No pressurized aluminum can. No propane foam. Just three drops of oil, wait a few minutes, and enjoy the effervescent and natural scent. Then glide away with the razor of your choice. When I looked at the whimpy little Somerset bottle, I thought it was a gimmick product, designed and branded for folks who fancy white colors. After I tried it though, I threw away the pressurized, propane-shaving foam bomb.